Model T Ford Forum: Fender Iron Clamps? Model T Ford Forum: Forum 2011: Fender Iron Clamps? I am building a 1919 that I had to buy fenders and fender irons for and the 19 style fenders do not come with the clamps/brackets that hold the fender to the fender iron. I've never seen the clamps/brackets for these before and have no idea on what they should look like or how they even attach. Any ideas on what I should use? Is there supposed to a brace on the inside of the fender these attach to or do I drill a hole in the fender and have a nut sticking out the top side of the fender? A picture of an installed fender would be very helpful if anyone might have one. The new fenders don't come with the brackets. You need to remove the brackets from your old fenders and then rivet them to the new fenders. The mounting brackets are riveted to the underside of the fender. 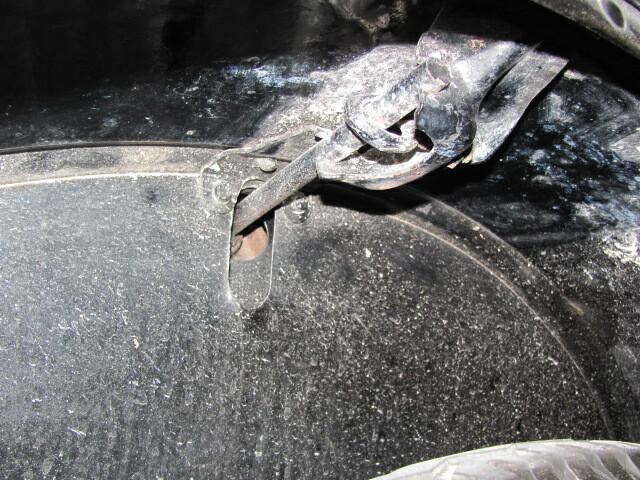 The fender iron passes thru the open cleat of the bracket. The fender eye bolts are fitted around the fender iron and the bolt is attached to the bracket. 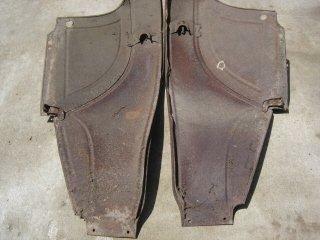 rear underneath view of 1924 touring right rear fender. Just for giggles,the front wheel hub nuts are about the same size and shape,so They can be used on the eyebolts. So I need to find me an old set of fenders from somewhere then and steal these brackets off them? There is an endless supply of junk fenders that are only good for the brackets. Post a want ad on the club classifieds and see if anyone is willing to cut some junk fenders on both sides of the brackets and send you those pieces (you'll have to grind off the rivets). Or contact the frequent classified posters who have large inventories of used Model T parts for sale. I've sent a few emails to some of the guys I know that have used parts just now. Thanks for all the help. You will need the dememtions of where thay mount. Some one may have a drawing for there location. Call Mark and Model T Haven and tell him what you need. Don't forget the front fenders have an additional small bracket the bolts directly to the frame...often referred to as the "L" bracket. Not the best picture but here is a shot of the underside of front fenders showing both clamps. There is an earlier version of that eyebolt too. It is heavier, or fatter which ever you want to call it. I guess they were used in '13 on back. 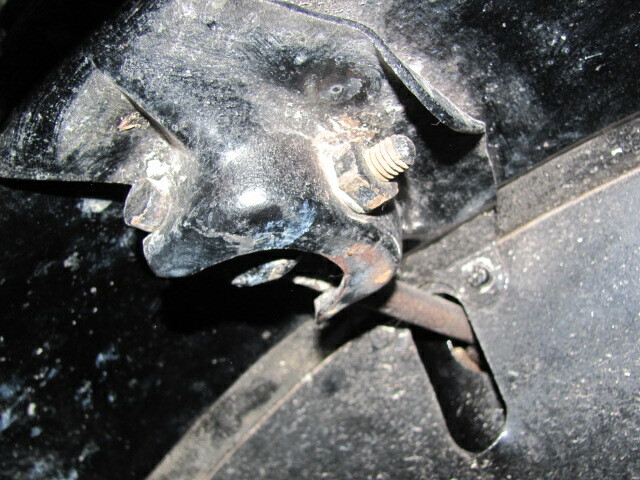 The fender brackets are left and rights so be sure to get correct ones if you are going to purchase any used ones. You can also cut angle iron and drill holes in it to make the brackets if you need to.